Era #1 is the agricultural phase. There are two 9-step runs. Era #2 is the industrial phase and there are two 12-step runs. The resources are very limited, only one starting resource for each run. Great mod, along with the patch to stop crashes it really feels like an entirely new game. I’m wondering though.. time progression seems very slow and there’s only the two available trains so far. Is this intentional? ok, played it longer, mind blown etc, faith in this game utterly renewed even though it isn’t an official release. Have some concerns though about the mod. In that having more cars per train (is there a mod for that) and more tracks per station would trully enhance what you’ve accomplished here. But the game itself is.. almost not up to task. Where after Nafta II I don’t think Firaxis 2K should consider another game on anything lower then win7x64 with gobs of ram and dedicated 3D hardware. In the later stages of this scenario laying track takes a minute and even though it is still worth it, i wonder where that leaves Nafta III? Is there any possibility for another game saving mod like this one? There should be a number of high quality maps. You may want to check out Basin & Range, Utah and the newer Aberdeen Carolina and Western Railroad. Unfortunately there is no way to add more than eight cars, it is a game limitation that only Firaxis can fix. I really like this map even if the production routes are very convoluted which is part of the enjoyment of this map. I may have found a problem however. I had to ship processed coal. At first the refinery converted coal to processed coal. After a little while it stopped processing coal although it carried on converting oil into nitrates. Also processed coal dissappeared from the list of products. Other problems I’m afraid. Various products after a while stop being produced even though the correct resources are being shipped to them. The trains that are set to only run when full run when empty from the places where the resources stop being produced. An example of this is producing grain for animal feed. Starts OK then stops producing for no reason. Shame really as the map is good. I suggest you to read it. Also be sure that the Usermaps and CustomAssets folders are completely empty before you install this map. As for the disappearing coal, i have not heard thisd before. Please try again and see if it still happens. Followed your suggestions. Plays fine now. Getting a bit frustrated here!! Tried everything but can´t get it to work. Installed it like 20 times but without any luck. Can anybody help with a bulletproof plan ? This is rather large map. Demanding on your computer resources. What kind of a machine do you have? Not the strongest I know. 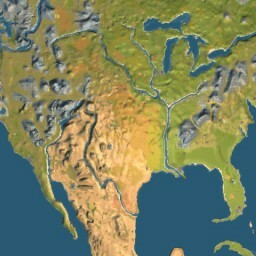 First of all I can get it to show the NAfta II map in the menu. Have I placed the files the wrong place? Kept the files where the installer put them. I am also having issues getting this map to work. I have a SMR install with the 1.10 patch and the 3gb patch installed. I have a clean UserMaps and CustomAssets folder. I unzip this file into the UserMaps folder as is. I start the game, choose this map and then it crashes the game to desktop as a few seconds of loading. All other maps I have downloaded and tried seem to run correctly (minus a separate problem with Europa2 deluxe.) Do I need NAFTA I for this? Do I need to add files to CustomAssets? Now this is the sort of map that should have been in SMR from the start. When you need to set up a train with 7+ stops in order to produce a final end good then it’s a scenario that won’t have the usual situation where the last few decades are just spent “marking time” until the game ends. There is a CTD problem with this map when the first metropolis develops, but we are looking to fix it. Wow! I just pulled out my old SMRS game the other day not even knowing you guys developed all these maps and such to keep the game going on. I have played several of the new maps available here and just tried this one. It is excellent however I also CTD with the first metropolis. I do love the design and layout of this so I’m crossing fingers and toes that you can figure out the problem. Thanks for making one of my all time favorite games even better! Off to other maps…like a kid in a candy store! I hope you find the CTD issue as this is such an involved map and scenario that I hope I can play it to the end sooner rather than later!! Absolutely crazy about all of Jancsika’s maps. This one keeps crashing somewhere in 1887. Ran I all the way. I restarted a game several times from different points and the result was always the same. Crashed in March 1887. I started a new game and was unable to get past that year. It crashed in Dec 87. Have played several other of his games with no issues. Oh, and is there any update on the horizon? I really want to finish this one. It is one of the best ever! Jansika Passed away 2 years ago so no updates. Yeah, I knew that. He was the best map maker ever. He made this game great! I thought that someone else might have access to the program and be able to correct the metropolis bug. How far is the fix? Can I put some effort into it by helping you guys out? I would appreciate any kind of feedback!